Delaware, due to being the first of the original 13 colonies to ratify the Constitution on December 7, 1787, is distinguished as “The First State” of our nation. Like former NBA great Shaquille O’Neal, however, one moniker just isn’t enough for Delaware. Even though it’s the second smallest state in the union, it boasts many monikers such as “The Diamond State,” “Blue Hen State,” and “Small Wonder,” giving Delaware an impressive nickname-per-square mileage ratio. Equally impressive is the longevity of Delaware’s longest-tenured senator Joe Biden. His 36 years in office puts the former Vice President of the United States in the top 20 all-time of longest-serving senators in the history of our country. During his time in the Senate and as vice president, Biden has been an advocate of investing in America’s infrastructure. Not only is concern about the conditions and viability of the roads on which we travel significant, but attention must also be given to the manner in which we travel. Having a proper understanding of the vehicles we drive and the best ways to insure them is important while traversing these ever-changing, ever-expanding roadways. To get your free quote comparison, enter your ZIP code today! Finding the time to research all there is to know about car insurance companies in Delaware and their rates and practices can seem like an impossible task. Delaware is one of only a few states that is considered “no fault,” meaning regardless of who is found to be at fault for an accident, all drivers must seek compensation for damages from their own insurance companies. The Diamond State mandates that all drivers carry Personal Injury Protection (PIP). The minimum amount of PIP coverage required by law is $15,000 per person, $30,000 per occurrence. In addition, $5,000 funeral services coverage is required. $25,000 for bodily injury or death of one person in an accident caused by the owner of the insured vehicle, $50,000 for total bodily injury or death in an accident caused by the owner of the insured vehicle, and $10,000 for property damage per accident caused by the owner of the insured vehicle. Delaware does not require you to carry Uninsured/Underinsured Motorist coverage, but it is a viable option and can protect you and your passengers if the at-fault driver has no insurance, or if you’re the victim of a hit-and-run. Self-insurance is available in Delaware to individuals and businesses with 15 or more cars registered in the state. Next, we will take a look at how much motorists in Delaware pay on average for auto insurance. The amount you actually will pay may be slightly lower or higher than these figures, but this data will provide you with some context from which you can project your own situation with reasonable accuracy. That funny quote from the illustrates the concept of one’s Disposable Personal Income (DPI), which is the money you’re allowed to keep after the government takes its cut in the form of taxes. State Farm, the largest auto insurer in Delaware, has a loss ratio of 60.02 percent, which is a healthy rate. Typically, a loss ratio between 40 to 60 percent is considered standard. Too much higher would mean that a company is paying out too many claims and would have a hard time remaining solvent. However, if a company’s loss ratio is well under 40 percent, that means the company is pocketing much more money in premiums than paying out in claims or discounts to its customers. A little over 11 percent of drivers in Delaware (11.4 percent to be exact) don’t have insurance, which ranks as the 28th highest percentage in the country. As a counter to the those who choose to forego any coverage altogether, you may consider opting for additional coverage options to protect. You can consult this Instant Auto Insurance Guide provided by the Delaware Department of Insurance for a quick and helpful summary of all the enhancements available to you. One such option in the Blue Hen State is Medical Payments Coverage. 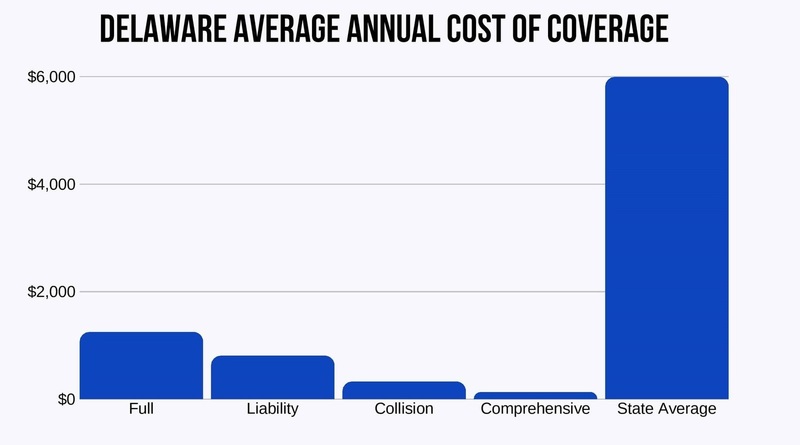 This coverage pays for reasonable and necessary medical expenses, without regard to legal liability, resulting from accidental bodily injury while operating or occupying an insured vehicle or being struck as a pedestrian by a motor vehicle. Despite the increasing popularity of pay-by-the-mile auto insurance plans offered by companies like Metromile, they are currently not being offered in Delaware. Other Usage-Based Insurance programs (UBI) are active and available to drivers in Delaware. Programs like Drivewise from Allstate or Snapshot from Progressive or CoverageMyWay from Esurance offer discounts to drivers based on how well and how often they drive. Through her alter ego, Sasha Fierce, Beyoncé introduced the world to the melodious thought exercise, “If I Were a Boy,” highlighting the double standards and differences in expectations that exist for women compared to their male counterparts in our society. Queen Bey raises an interesting debate. If she were a boy, would her car insurance rates be any different? Would they be better or worse? Here’s a look at the Most Expensive Demographic rates in the Diamond State. Can you see where you fit in? Are you having a better idea of what car insurance in Delaware might cost you and your family? As you can see, whether you’re a boy or girl, young or old, in Delaware, it’s going to cost you a pretty penny (actually, a lot of pretty pennies) to be insured with Liberty Mutual Fire Insurance Company. Is car insurance more expensive in Northern Delaware or in Lower Slower Delaware? Sifting through all the information to find the auto insurance company that is a right fit for you can be overwhelming. Who’s going to give you the best rates? Who has the best customer service? Do you qualify for any discounts or upgrades? In a state that boasts more chickens and corporations than actual human beings, it’s hard to even know whom to ask for advice. No need to worry: we are here to help you find the relevant information you need to make a wise decision. When deciding on a car insurance company, you should seriously examine its public reputation. Doing your due diligence will ensure that you don’t end up in an acrimonious relationship with an auto insurer that leaves you feeling so dead, held up so high on such a breakable thread (breakable thread). A company’s public reputation can often be a strong indicator of the kind of rates it offers to its consumers. We’ll show how the largest companies rate in the areas of financial stability and customer satisfaction. AM Best is a credit rating agency. It evaluates insurance companies and grades them based on their financial stability. 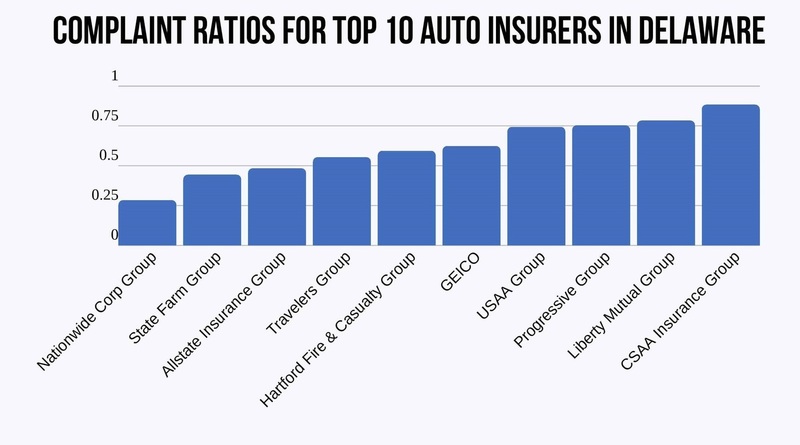 The table below shows the ten largest insurance companies in Delaware as measured by direct premiums written with their AM Best rating. For any relationship to be successful and long-lasting, trust has to be a major factor. Both parties must work together to achieve satisfaction. Unfortunately, satisfaction can’t always be achieved in every relationship. When a consumer is dissatisfied, he or she can file a complaint. Those complaints, justified or not, are factored into a company’s complaint ratios. If you wish to file a complaint against an insurance company in the state of Delaware, use this online form. This chart gives a visual representation of the car insurance companies with the largest market share in Delaware. Ever wonder how many licensed auto insurance companies are in Delaware? The answer is 867. 101 are domestic to Delaware, while the remaining 766 are foreign to the Diamond State. Curious about how your credit history impacts the quotes you receive from car insurance companies? Consumer Reports conducted a study for Delaware analyzing the effect of credit history on premiums. A married 60-year-old female will pay $1,610.37 on average with Travelers; while a 17-year-old single female will pay $9,243.54 with the same company. When it comes to shopping for the best car insurance rates, remember these two words: Do You. Choose the company offering the best rates for your personal situation, not anybody else’s. Trying to memorize every traffic law in Delaware would be both mind-numbing and impractical. We’ll help you to sift through the nonessentials and highlight those regulations which are most relevant Delaware drivers. Insurance companies in Delaware are subject to the regulations set by that state insurance commissioner. Ultimately, all rates and regulations must meet the fair competition standards set by the National Association of Insurance Commissioners (NAIC). If you do require the SR-22 insurance proof in DE, that means your license is or will be suspended or revoked and you cannot legally drive in Delaware. Filing the correct documentation and meeting other requirements per the DMV can help you toward eventually reinstating your driving privileges. Delaware has no specific laws requiring insurance companies to offer special glass coverage or no-deductible windshield replacement. Your insurance company may require you to use a specific repair shop in order to receive coverage. As a consumer, you have the right to choose repair vendor but you may be required to pay the difference in the quote. For a detailed summary of windshield and glass coverage in Delaware, refer to this article. But consumers aren’t the only ones perpetrating auto insurance fraud in Delaware. American Standard is under investigation by Delaware Attorney General Matt Denn’s office for allegedly running an auto warranty scam. If you suspect insurance fraud or have been the victim of fraud, you can contact the Delaware Department of Insurance to report such activity. Delaware’s statute of limitations for filing a claim is two years for both personal injury and property damage. Don’t make the mistake of driving in the state of Delaware without proper registration and insurance. It would be unwise and potentially costly to do so. Delaware’s DMV has an online portal where residents can perform tasks such renew their registrations and drivers’ licenses, update or change their address, and retrieve their driving history. Vehicle registration and insurance information can be easily accessed through the state database. The penalty for driving without insurance in Delaware is as follows: A minimum $1,500 fine and license suspension for six months for a first offense. A second offense within three years will earn a minimum $3,000 fine and license suspension for six months. For information on what the requirements are for financial responsibility in Delaware, click here. Delaware employs a Graduated Driver License program for young drivers, designed to reduce the high accident and fatality rate among teen motorists. The program seeks to give young drivers supervised driving experience to assist them to eventually earn their Level 1 Permit and Class D License. To be eligible for Delaware ‘s Level 1 Permit teen drivers must be a minimum of 16 years old and under 18 years old. The learner permit candidates must present proof that they have completed a certified Delaware driver’s education course. When applying for a learner permit, the teen drivers must have a sponsor sign the permit application. The sponsor is held responsible along with the teen drivers for any negligent damage that the permit holders may cause until they reach the age of 18. While driving the supervisor or sponsor must sit beside the teen driver while the vehicle is in motion, no other passengers are allowed to sit beside the permit holder. This mandatory supervision is in effect for the first six months that the teen driver holds the permit. Level 1 permit holders must have certified documentation of 50 hours of driving, 10 of which must be nighttime driving. Like all drivers in Delaware, a texting ban and handheld device ban in place for teen drivers. In fact, Level 1 permit holders are prohibited from using cell phones altogether when driving, even if it’s mounted or connected to Bluetooth. When the teen driver with a Level 1 Permit has been driving for a full year and is in good standing (without suspension, revocation etc. ), the permit will automatically convert to a Class D License. Delaware can never be accused of ageism against its senior population when it comes to their driving laws. Elderly drivers in Delaware must get their licenses renewed every eight years just like every other driver in the general population. Just like the rest of the general population, senior drivers must show proof of adequate vision at every renewal. And just like the rest of the general population, elderly motorists are prohibited from renewing online or by mail; all drivers in Delaware must renew in person. If this is your first time being a resident in the First State, you may have some questions regarding how and when to apply for a new license in Delaware. The DMV and Department of Transportation in Delaware have provided you a lifeline in the form of this useful resource: Guidelines for New Residents. Bring all required documentation to a driver’s licensing location to obtain your new Delaware driver’s Iicense. Driver licenses must be renewed every eight years. Renewals must be done in person. You should not wait until your license expires. Delaware is a “no fault” state, meaning all drivers must seek compensation for damages from their own insurance companies. Delaware law requires that you keep right if driving slower than the average speed of traffic around you. Delaware adopted a new “Move Over” law on January 1, 2007, requiring drivers to move over and for emergency vehicles while simultaneously lowering speed as they pass. The law bars drivers from driving in the lane next to shoulders where emergency and nonemergency workers are present. Delaware requires drivers and all front-seat passengers 16 and older to wear a seat belt. A violation is not a primary offense. Passengers in the back seat ages 8-15, or weighing 66 pounds or more, are permitted to use an adult safety belt. All children 7 years old or younger, or weighing less than 66 pounds, are required to be seated in a child safety seat. They are not permitted to use an adult seat belt under any circumstances. To date, no auto insurers in Delaware offer insurance specifically for ridesharing services. The goal of all safety laws should be to ensure the well-being of all motorists and pedestrians on the road. The Delaware Department of Transportation (DelDOT) has compiled a list of helpful safety resources regarding traffic and safety laws. One of those such resources is the Delaware Strategic Highway Safety Plan. The Blood-Alcohol Content (BAC) limit in Delaware is 0.08 percent; the High BAC limit is between 0.15 and 0.2 percent. Currently, Delaware has a Zero Tolerance Policy on THC and metabolites. Car theft is no laughing matter. 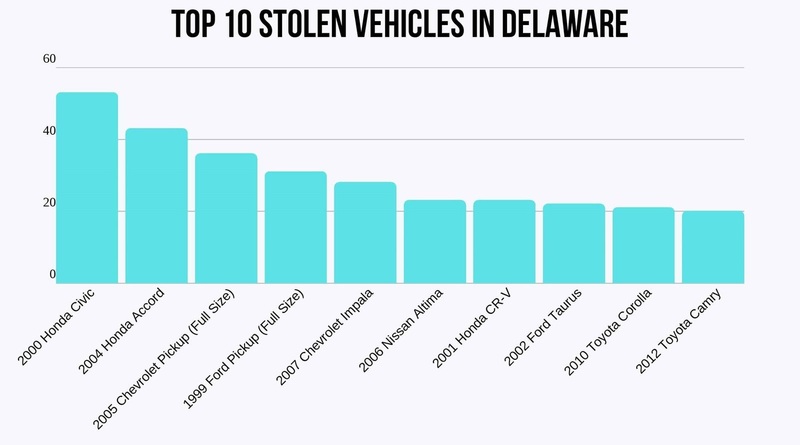 Which cars in Delaware are most popular to car thieves? Check out the chart below to find out. For your information, we’ve compiled a list of all driving-related fatalities in Delaware. The Diamond State, along with southeast Pennsylvania and southern New Jersey, form the congested tri-state corridor of the Delaware Valley. So, how bad is the commute look for the motorists of Delaware? How does rush-hour traffic compare to the rest of the nation? What methods do they use to get to work? The answers to those questions are coming up next. At 25 minutes, Delaware motorists almost mirror the national average of 25.3 minutes of commute time. Only 2.48 percent of Delawareans experience a “super commute” of 90 minutes or more. Now you have all the essential facts about Delaware driving laws and insurance requirements. Make sure to put all that knowledge to good use to get yourself the best insurance quotes possible. Enter your zip code below to compare car insurance quotes and to ensure you’re getting first-rate rates from the top auto insurance companies in the First State.